Health Secretary Jeremy Hunt has announced government plans for wide-ranging social care reforms in England in a statement to the Commons on Monday. But what is the situation in England at present and why is reform necessary? How does the social care system work currently? Social care for the elderly covers non-medical needs such as support washing, dressing and eating. To be entitled to state support in England, an individual is judged on two criteria - means and needs. Everyone with more than £23,250 has to pay for support. Below that threshold, they contribute to the cost - with the amount paid based on means-testing of both savings and income. Those with savings and capital of between £14,250 and £23,250 have those assets taken into account when their contribution is assessed. Below £14,250, only a person's income is considered. If an individual needs a care home place, the £23,250 threshold also includes the value of their property unless they also have a partner who will continue living in the property. This has created a situation where some people have been forced to sell the family home. Those who qualify for help through means-testing are then assessed for need. Councils are obliged to provide care only if applicants meet a certain threshold. There are four thresholds - low, moderate, substantial and critical. It is up to councils to decide which standard they want to set depending on their finances. Have councils been making it harder to get help? Yes. The squeeze on local-government budgets is making it more and more difficult to keep the status quo intact. Councils have responded by increasing the threshold for eligibility. In recent years, many councils have stopped providing support to people with low and moderate needs. Currently more than three-quarters of local authorities allow access to help only when a person's needs are deemed substantial or critical. Effectively, this means that if a person does not need help throughout the day, they do not get any state help for things such as washing, dressing and bathing. The impact of this has been a fall in the numbers getting state help at a time when numbers wanting it are rising. In the last five years, the number of elderly receiving care from councils has fallen from 1.2m to 1m. The number of working age disabled adults has fallen - albeit by a smaller amount - and now stands at just over 500,000. It means an increasing number of people are having to fund their own care, rely on family or friends or go without. What are ministers planning on doing? The reforms are focused on ending the need for people to sell their own homes or losing all their wealth if they develop catastrophic care needs. They are not aimed at getting more money into the system. The plan is to cap the amount an individual will have to pay at £75,000. For someone in a care home, this will not include so-called accommodation costs, such as food, heating and paying for the room. 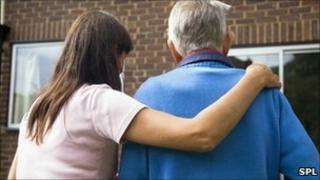 They are also increasing the means-tested threshold for people going into a care home to £123,000. For those who only need help at home, the threshold will remain unchanged. This means that anyone with an estate valued at below that level would not have to pay for care. Above that level they pay up to £75,000, but as soon as their estate is valued at the £123,000 mark those payments stop. So, for example, someone with an estate worth £150,000 will pay at least £27,000 before the means-tested threshold kicks in and means the state starts to pay. The situation can be further complicated if someone has an estate that is growing, perhaps because of a large pension or share portfolio. That could mean a person in such a situation pays more than £27,000 until the value of their estate is whittled down to £123,000. Someone worth £300,000 will pay £75,000 when the upper limit of the cap kicks in. Those with assets worth less than £123,000 will be means-tested for support. The average value of homes - most people's largest asset - shows that those below the qualifying threshold live mainly in the Midlands and north of England. Shortly after the coalition government was formed, ministers asked economist Andrew Dilnot to look at what changes should be made. His remit was quite narrow in that he was asked to look at how people's assets could be protected rather than whether the system needed more money. For this reason the changes being considered affect the elderly more than the disabled as they are much more likely to have built up the assets which would put them above the means-testing threshold. Mr Dilnot's review recommended introducing a cap on what people should have to pay - with £35,000 seen as the ideal figure - leaving the state to pick up any bill above that. He also suggested the means-testing threshold should rise four-fold to £100,000 for those needing residential care. The commission said these changes would mean that no-one ended up losing more than 30% of their assets in care costs, but to introduce it would cost an extra £1.7bn a year. The cap is viewed as an essential way of getting the system on a sustainable footing. It is seen as a way of getting the public to plan for old age and to encourage the insurance industry to get involved in developing policies for them, as it protects both from the risk of unlimited care costs. Wales and Northern Ireland both have means-tested systems which are similar to England's. Scotland, however, has already diverged since devolution. It provides free personal care, but in recent years has started tightening the eligibility criteria for the same reasons councils in England have. In fact, Audit Scotland recently raised the idea that the policy may have to be scrapped given the current financial climate. And so, while these changes only apply to England, what is happening is being closely monitored by the other nations in the UK. Further afield other countries have started thinking about changing their systems too. A variety of systems currently exist elsewhere in Europe, including insurance schemes, private markets and subsidised retirement villages, but none is viewed as having cracked the problem. In the US most services are run for profit, although faith groups are also beginning to get involved. Canada, meanwhile, has a means-tested system.